These are some of the questions tackled by the industry panel at Thursday’s Engineering Distinguished Lecture, which was timed to coincide with CSULB’s Imagine BEACH 2030 crowdsourcing campaign to examine the future. The lecture was moderated by Dean’s Advisory Board member Mike Niggli, a retired San Diego Gas & Electric executive who now serves as chairman of Portland-based energy storage company ESS. The five-member panel represented a variety of perspectives. Gaurav Bhattacharya co-founded Santa Monica-based corporate volunteering startup InvolveSoft only two years after graduating from CSULB with a B.S. in aerospace engineering. In contrast, Vice President of Engineering Norm Eng has been steadily moving up the ranks at Northrop Grumman for three decades. Phil Mathews, principal director of people acquisition at The Aerospace Corp., focuses on attracting and retaining talent, while economist Somjita Mitra, director of the Institute for Applied Economics, at the Los Angeles Economic Development Corp., focuses on the economy of the region. And Yannis Yortsos, dean of the USC Viterbi School of Engineering, has been teaching engineering at that institution since 1978. The Engineering Distinguished Lecture series was launched nearly a decade ago as a means of addressing National Academy of Engineering Grand Challenges. Over the years, topics have included renewable energy, drones, manufacturing, service robots, and smart grids. 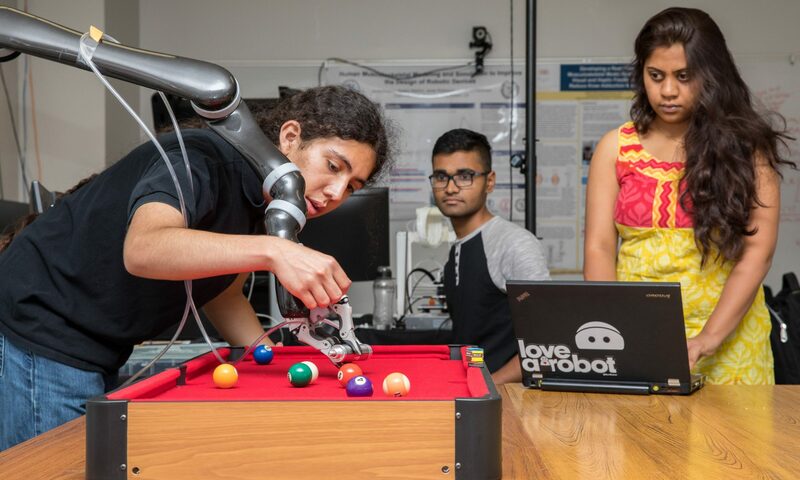 As CSULB College of Engineering Dean Forouzan Golshani noted, in Yortsos, this year’s panel included a National Academy of Engineering member who helped formulate those challenges. Northrop Grumman’s Eng concurred. “What we’re seeing in our technology is the convergence of a lot of disciplines” to accomplish complex feats such as designing an autonomous aircraft capable of landing on an aircraft carrier and autonomously refueling. Niggli asked how engineers should prepare to thrive in such an environment. In his hiring, Bhattacharya said he looks for employees who are curious, adaptable, accountable, and possess a willingness to learn and an ability to get along with people. Mathews said The Aerospace Corp.’s Leadership Competency Model takes many of those attributes into account. “All of those soft skills are baked in. It’s not just the technical skills,” he said. Rather than a graduate who did exactly what their professor told them and aced every exam, Eng said he’s looking for new hires who get along with people and demonstrate perseverance and courage. The face of engineering is changing, and society’s mindset about who should be an engineer must also change. “It’s not the Dilbert of the cartoons that you see in the newspaper,” said Yortsos, adding that the complex problems that need addressing are attracting people who were not previously attracted to engineering. Mitra said artificial intelligence will usher in a third wave of industrial change. Hundreds of years ago, 80 percent of the world’s population was agrarian. After the Industrial Revolution, 40 percent worked in factories. As AI brings about autonomous vehicles, manufacturing robots, and other large-scale changes, Mitra said the types of jobs available will change. Both Eng and Mathews said it’s difficult to retain engineers in this climate. “It’s a huge problem in our industry,” said Mathews. “People are literally flipping badges, going from one contractor to another. It’s hard to keep people.” The key to retention, he said, is investing in mentorship and continuous learning. The panelists were united in the conviction that engineering will remain an attractive career option for the foreseeable future. Eng’s daughters are already studying engineering and Mathews is nudging his children in that direction. “I see unbelievable opportunity if they follow a course in STEM,” Mathews said. Introducing engineering in K-12 is one solution. Programs are available where college engineering majors visit middle- or high-school classrooms to help educators teach engineering basics. Bhattacharya said he began learning programming at age 11 in New Delhi as part of a Microsoft program. From humble beginnings, Bhattacharya said his father died when he was age 2 and his mother supported the family selling utensils. Learning programming changed the direction of his life.